Larry Smith came in to pick up his 1.5 Million Mile Award and to announce his retirement from CalArk on the same day. 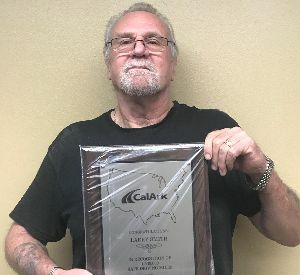 Larry has spent the last 11 years of his 41 year driving career with CalArk. Directly after leaving the army, Larry worked for a company called Royal Industries. The company made farm equipment and he pulled a flatbed for them from the plant to a rail yard. Among other companies on his resume are CFI, CRST, and Exxact Transport. He also spent some time as an owner operator. When asked what he would say to his fellow drivers and those who are entering the industry, he said, “Stay vigilant. You have to stay vigilant.” “Roads are getting more congested, and the motoring public is getting more dangerous. Stay vigilant."